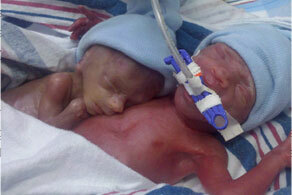 Our beautiful sons, Evan and Kyle, were born 4 months prematurely. 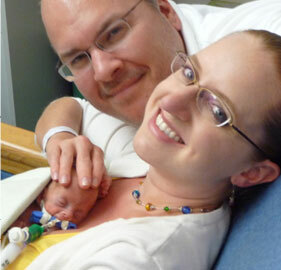 Evan weighed a mere 1 pound 8 ounces, and his twin brother, Kyle, was a tiny 11 ounces. Evan was immediately given a breathing tube for respiratory support, but there were no breathing tubes small enough for little Kyle; very sadly, he passed away a few hours after birth. Evan spent 5 difficult months in the Neonatal Intensive Care Unit in 2010. We spent every waking moment that we weren’t at work with him at the hospital. There were so many moments that we feared he wouldn’t live, but he’s a fighter. After many unsuccessful attempts to remove his breathing tube, he developed subglottic stenosis, which is a U-shaped band of very thick scar tissue. The scar tissue was so thick that it closed off his airway, so he had to have surgery to place a tracheostomy in order to breathe (a tracheostomy is a plastic tube inserted through the neck into the trachea). Evan spent another 2-1/2 months in the hospital in the pediatric pulmonary unit, but after a lot of hard work and many weeks of our tracheostomy-care training, he finally came home with us in early 2011. He has made great strides since being home, though he still has a tracheostomy. The tracheostomy was placed below the vocal cords, so no air could pass through his vocal cords allowing him to speak. Our son was nearly two years old and we’d never truly heard his voice, his laugh, or his cry. So many people take such little things for granted, but to us, they were huge. We couldn't wait to hear our little guy talk!! Evan needed 24/7 care because he could have pulled out his trach at any time; at that age he was very strong, and as a nearly-two-year-old, he’s quite curious. He started pulling on his trach and the velcro-foam ties that hold it in place, which made our hearts skip a beat with fear every time. We couldn't risk Evan pulling out his trach because his airway was so small that he was not able to breathe without it; it would have only taken a matter of seconds before the hole would start to close, and a few minutes before it was completely blocked, possibly resulting in death due to oxygen deprivation. During this period happily cared for Evan all day long, as our insurance company did not cover daytime nursing support; nor was Evan able to go to daycare or have a nanny. We had been using an overnight nurse to watch him after 11pm for several hours so that we could sleep. Until the Spring of 2012, our insurance company had covered the cost of the overnight nurse; however, the insurance company denied our request and several subsequent appeals for further overnight nursing. All of Evan’s doctors and other medical professionals agreed that it was absolutely, unwaveringly necessary to have overnight nursing support for a child with a tracheostomy not only because he could pull out his trach during the night, but also because his tracheostomy requires frequent suctioning to remove secretions that develop over a short period of time and block his airway. We simply couldn't stay up all night and also work during the day, or safely take care of Evan during the day, for a prolonged period of time; and the insurance company is expecting us to do this on our own for the rest of the year. Evan was (and still is) a most sweet, adorable and curious little soul. Despite all he’s been through, he is a very happy, energetic little guy. He endured some physical developmental delays due to the long-lasting trauma associated with the tracheostomy. He is just now learning to walk on his own, but the delay doesn’t stop him from being a little monkey. His smile is infectious and his energy is boundless. Evan is a wonderful, miraculous child who deserved the safety of overnight nursing care and parents who have enough energy to continue to help him learn and grow. We had done a lot of research and talked with many people from many support groups, state programs, etc. Unfortunately, we did not qualify for any state assistance programs to help cover the cost of overnight nursing, which was approximately $11,000 per month (to keep the capable nurses we’ve had for many months who know Evan and who we trust). In addition to nursing costs, Evan had a lot of other medical expenses as well that are not covered by insurance. He went through laryngotracheal reconstructive surgery in late July, and his trach was successfully removed in late October 2012. We appreciate all of your support. If you need to get in touch with us, please send us an email and we will do our best to get back to you as soon as possible. © 2013 FindMyvoice.org. All rights reserved.